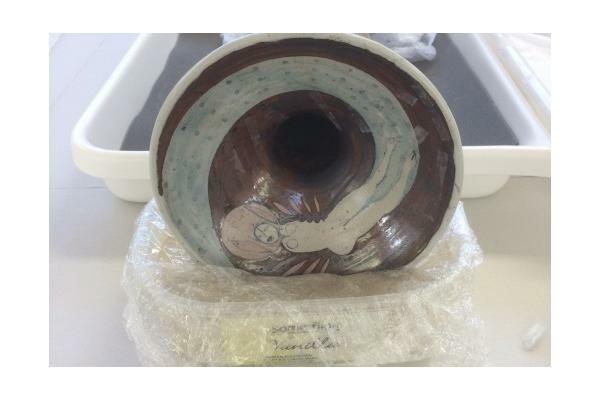 One of the main attractions of the Ceramic Conservation course at West Dean College was the unique and fantastic opportunity of being able to work on "real" objects. 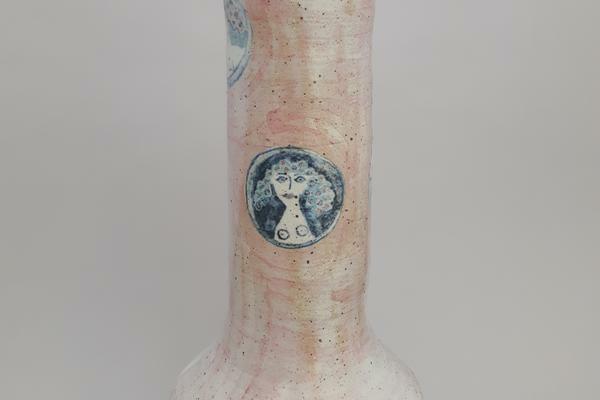 A tall elegant vase was received by the ceramic department for conservation. On this occasion it was agreed that this project would provide a good opportunity to work together as a team. Until this point we had all been working on our own projects, some following the same processes but all working alone, making independent decisions. 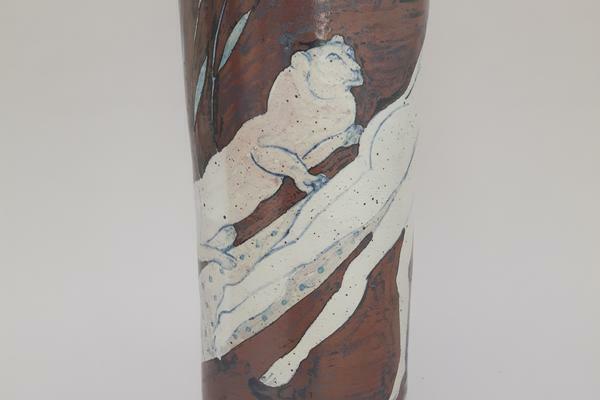 The stoneware vase, dated 1986, is the work of Eric James Mellon (1925-2014) Painter, Ceramist, Printmaker. 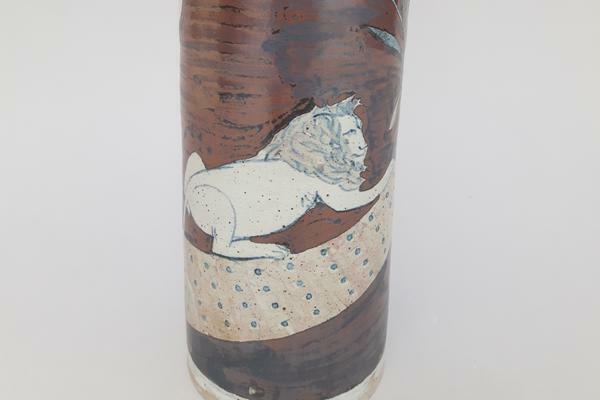 Eric James Mellon, who lived and worked in West Sussex and developed an original form of narrative figurative illustration that transferred well to ceramics in a highly individual manner. 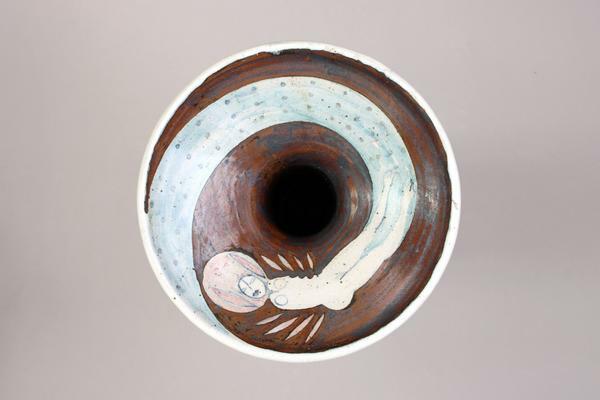 He was known for his pioneering use of ash glazes, but first and foremost he was an artist who used a range of mediums to communicate ideas and issues central to human life. He was concerned with work that focused on his love of the natural world, the beauty of the human form, flowers, animals and landscape, whilst commenting on the experience of our lives: love, birth, grief, war and life's pressures, all displayed with an ethereal quality. 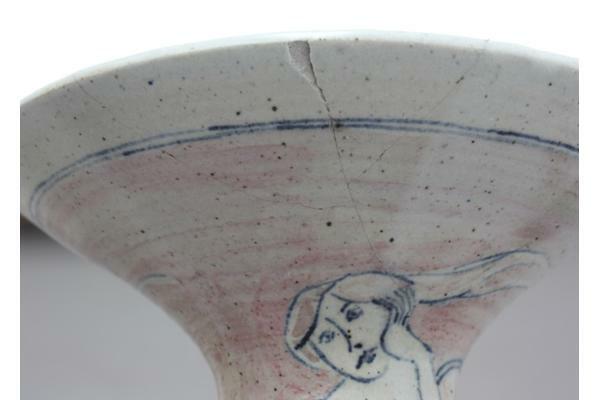 To most people ceramics are seen as a strong material, not susceptible to decay like wood, metal, textiles or paper, however, nothing remains unchanged forever. The disappointment when something breaks that is irreplaceable or much loved can be significant. 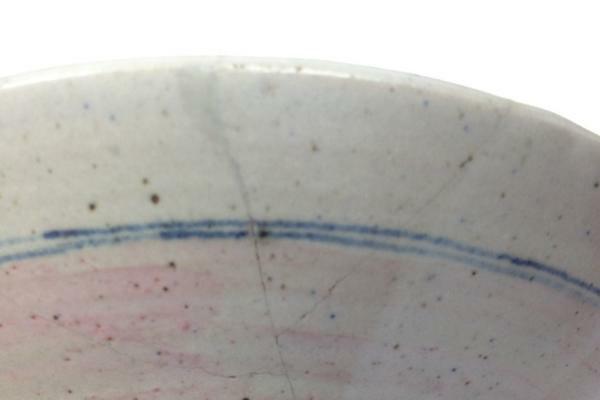 The value of the object might not be cultural or financial but rather personal. It is the intrinsic sentimental value that is priceless to the owner. The desire then for a client maybe to restore an object to its original state. 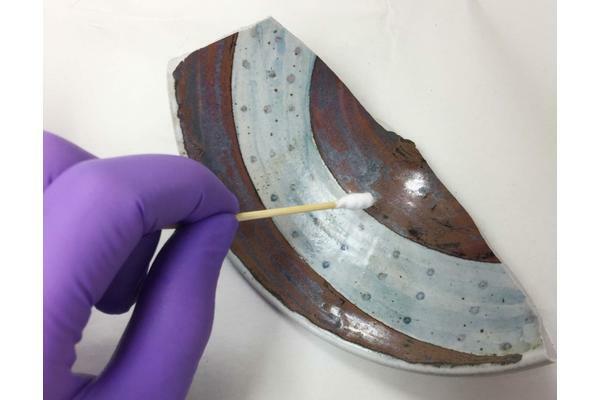 As conservators we aim to conserve the object; to stabilise, strengthen and protect the original so that it can again be enjoyed. This project served as a reminder that the reasons for the sentimental value a client puts on an object can be most interesting. The additional information relayed by a client who has interesting anecdotal stories brings an object to life but can sometimes increase a sense of responsibility. 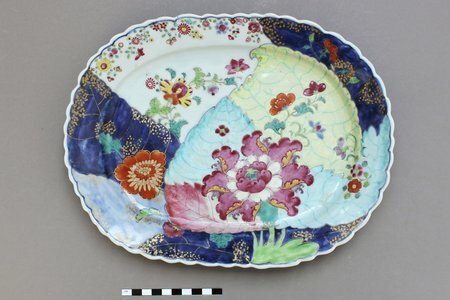 What made this project so interesting, apart from working as a group, was that the artefact was by a local artist and served to remind me why I love ceramics so much. The chance to research the work of an artist of whom I was unaware, and to view further pieces in a collection of his work, made the project all the more personal. I was drawn to conservation because I wanted to work on objects, but nothing takes place in isolation and you still have to deal with people, communicating and working with the client to conserve an object is essential to ensure a successful outcome. 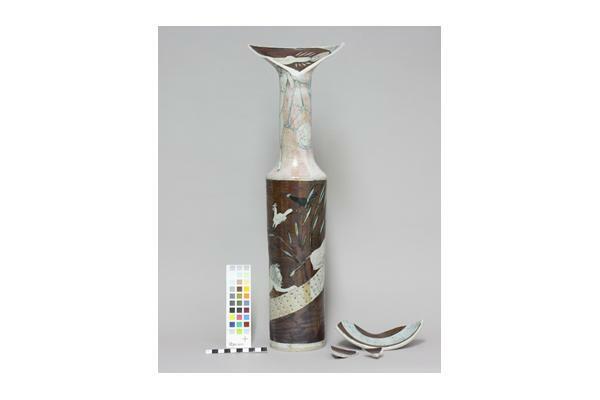 The impressive tall stoneware vase is decorated in Philadelphus ash glaze with appealing hand-drawn decoration on every surface, and was received broken into four major sections at the neck of the vessel on the top rim. 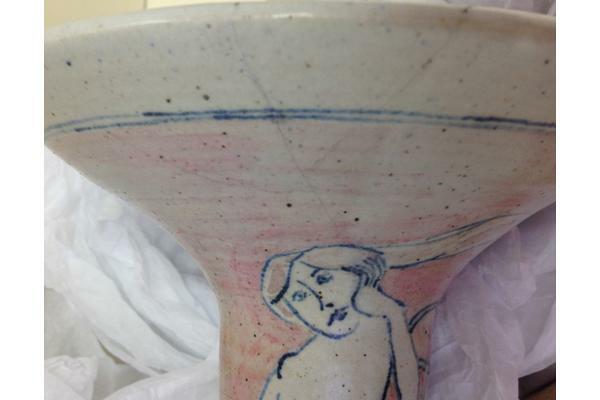 Unlike most craft potters, the work of Eric James Mellon has an increased focuse on surface over form and function - he regarded the surface of a pot to be of greater interest than its form. 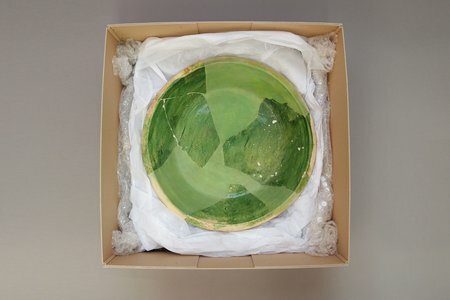 This interest led him to spend over fifty years working on ash glazes and his creation of ash-glazed pottery that preserves underglaze graphic art is highly regarded and once you start to study his pieces, you can immediately understand why. Eric James Mellon, as an artist, found that over time a drawing on clay would sell better than a drawing on paper. 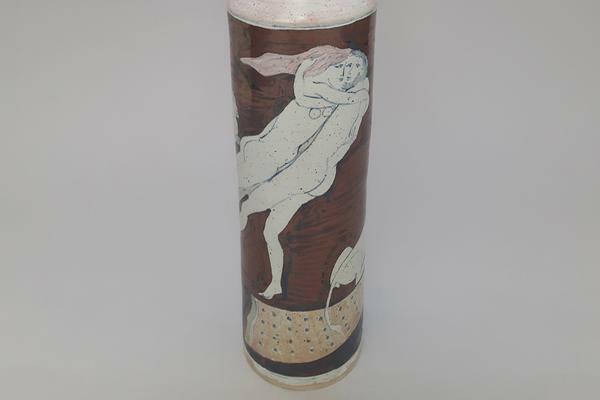 He was an artist who used ceramics to communicate ideas and, like most artists, his work is grouped in themes, with this vase belonging to Tenderness. This is concerned with the relationship between man and woman and the birth of children and scenes of intimacy. "The work of the artist produces the things for which a civilisation is remembered. 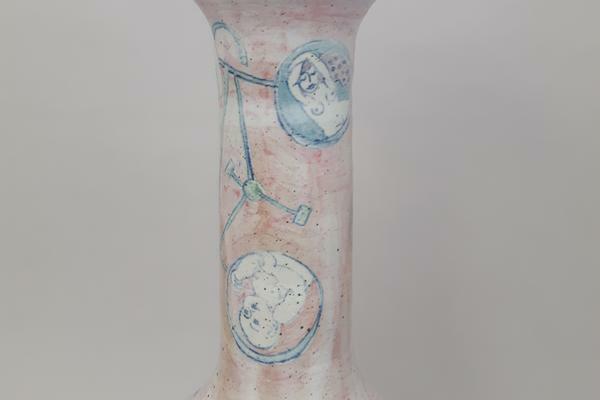 It produces great wealth for the societies that treasure it, and the artist adds to the reservoir of cultural excellence that makes life worth living at its highest levels"
From Eric James Mellon: The Ceramist As Artist, published in collaboration with South East Arts in 2000. Conservation is increasingly an interdisciplinary practice, acknowledging the importance of shared knowledge and the value of discussing research which aids to improve conservation practice. Once the tasks had been assigned, we all managed our own allocated element, there were no disagreements at any stage and we all consulted each other and discussed the best approach throughout. 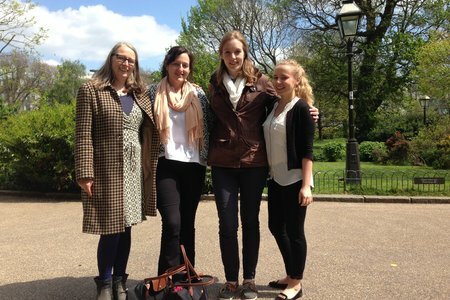 Whilst writing this blog post I consulted with all those involved to ask what they thought of this experience. One of the key benefits identified was that by working as a team we were able to complete the project quickly and efficiently. We are incredibly fortunate at West Dean College to have so much time allocated to practical workshop time, however, undertaking conservation treatment, especially for someone at the beginning of their career, means that individual projects can take a long time; and this can feel disheartening at times. So a collective endeavor allowed for a relatively speedy conclusion. 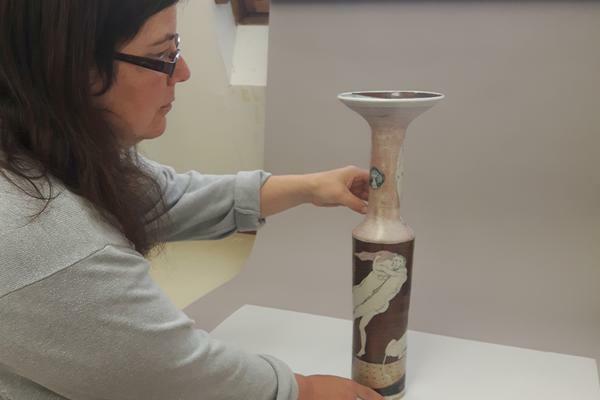 The conservation of the vase has been extremely successful, as has the objective of team work. 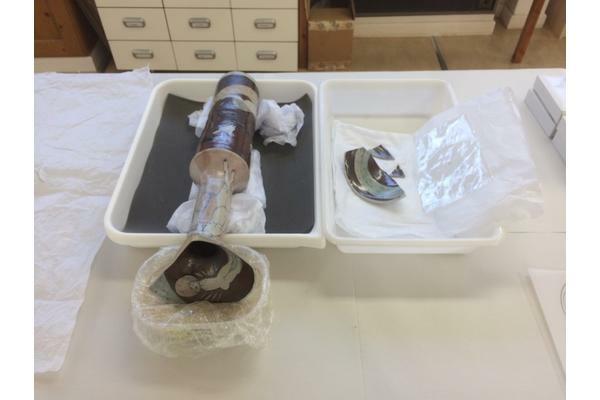 The work undertaken could have been achieved individually by any member of the group, but as we were able to complete it much more quickly as a group this enables the object to be returned to the client sooner. 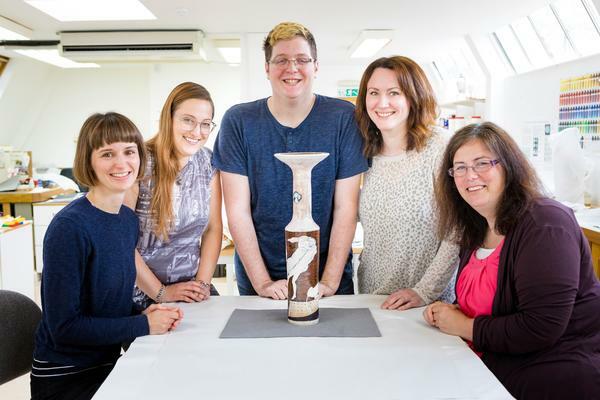 As a result of the time spent conserving this vase, we were able to expand our knowledge of a local artist whose dedication to his art and the exploration of ash-glazes were truly inspirational. In hindsight, it would have been advantageous to have recorded even more of the individual tasks we all carried out. Documentation is another key aspect of our work and photographic evidence is essential, an aspect continually encouraged. Often when undertaking the 'work', you are so enthralled that you keep forgetting this important aspect - what seems the most mundane process can become key photographic moments. Most of the projects I have previously been involved in have been very formal, but this project was far more creative and collaborative. It was great to work together to complete the project and see the finished object - as Holly noted "an important part of the learning experience". I could not agree more and look forward to our next joint project.